Man muss die Pflaumen essen, wenn sie reif sind. Deshalb gibt es zum heutigen Tee einen leckeren Pflaumenkuchen. One must eat plums when the plums are ripe. Therefore we will have a yummy plum pie for today's tea. Ich habe den Tisch schon gedeckt mit allem, was uns der Herbst beschert. 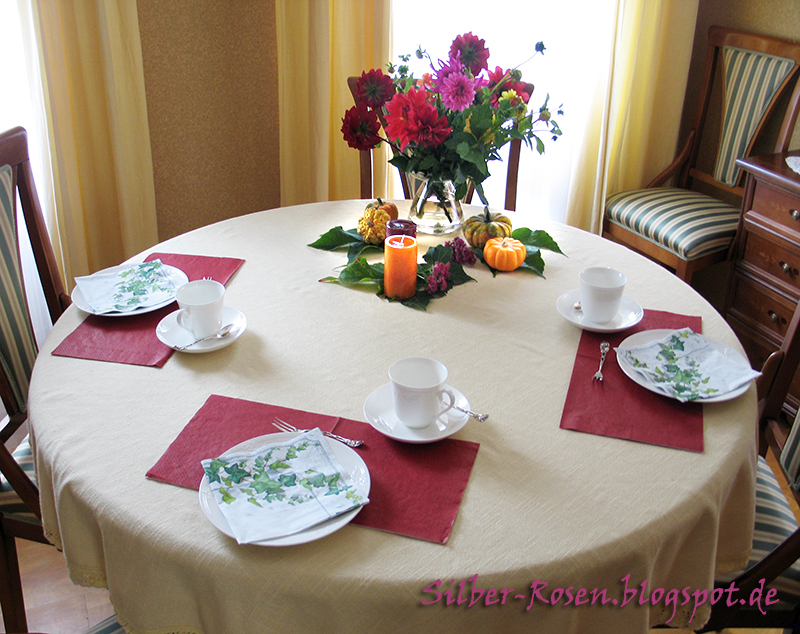 I have set the table with all the pretty things, autumn gives us. 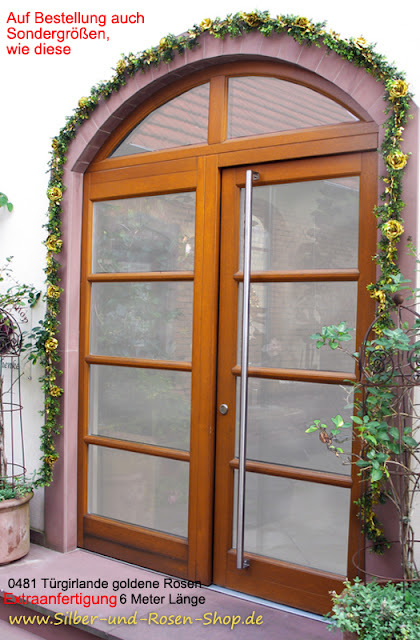 Farbenfrohe Dahlien und glänzend gelbe kleine Kürbisse stehen in schönem Kontrast zu den grünen Weinblättern. Kerzenlicht macht die dunklen Nachmittage jetzt gemütlich. 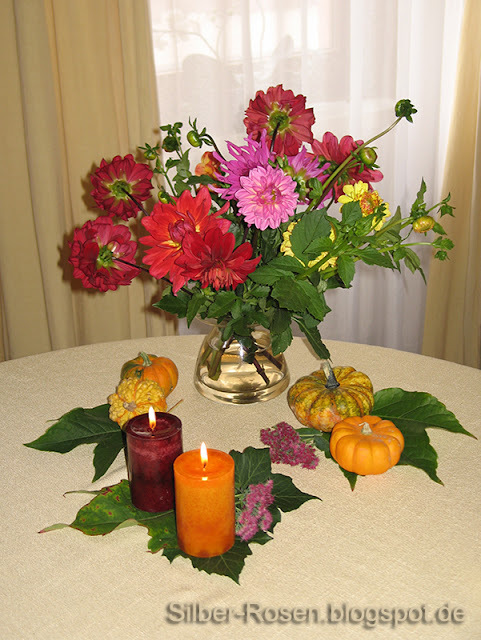 Colorful Dahlias and shiny little pumpkins are in wonderful contrast to the green wine leaves. Candlelight brightens the dusky afternoons. Mit Papierservietten kann man schnell Farbe auf den Tisch zaubern. Paper napkins make a colorful setting easy. Und natürlich ist das Rosen-Besteck mit von der Partie. And surely I love to use my rose flatware. Ich habe dir schon Tee eingegossen und Kuchen auf den Teller gelegt. Lass es dir gut schmecken. Es gibt nichts Schöneres, als den Nachmittag mit Freunden beim Tee zu verbringen. I poured tea and placed the cake for you. Enjoy. There is nothing better than to have tea in the afternoon with friends. Text und Fotos begeistern mich. The plum pie looks delicious. Yes, you must eat them all! I'll help! ;) Lovely Autumn tea. What a lovely tea you've share today, Johanna. 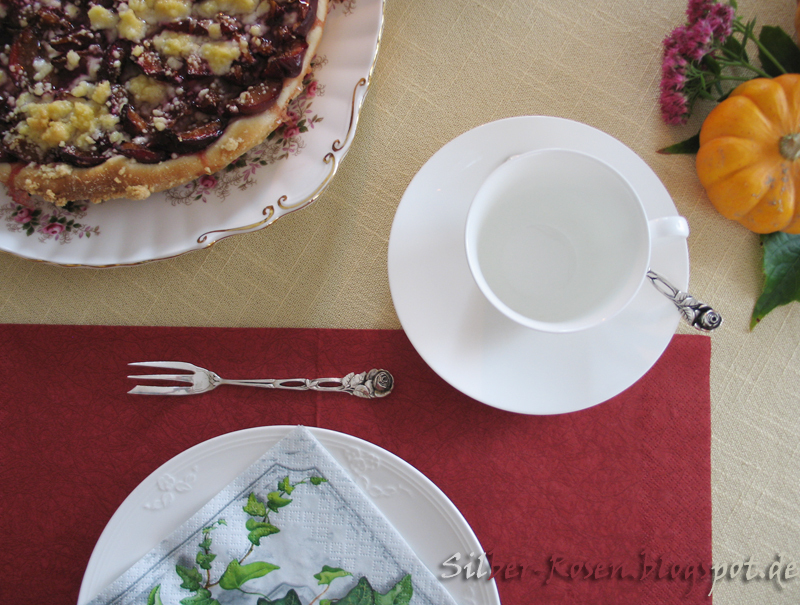 I would love to join you for some of your plum tart and a cup of tea. Hugs and blessings to you. Oh, that plum pie looks so good! 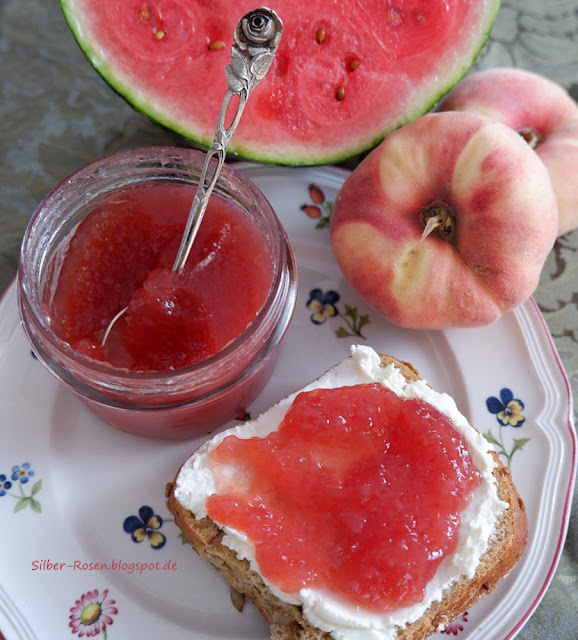 A perfect treat to have with tea. You always host the nicest afternoon tea times, Johanna! Have a wonderful tea day! Oh, dein Pflaumenkuchen, liebe Johanna, sieht sehr lecker aus. Wie gut, dass ich gestern auch ein Blech Pflaumenkuchen gebacken habe. Sonst wäre ich womöglich bei dir vorbeigekommen und hätte deinen Gästen alles weggenascht. Hi Johanna, Your plum cake looks awesome! Mmmmm! I like your rose flatware and your dahlias too! ich würde gern an dem herrlich gedeckten Tisch Platz nehmen. Oh wow your plum pie looks delicious and also very beautiful! I love the dark color of the plum. The table setting is so lovely, too! The silverware is very pretty with flower shape. What a wonderful tea time. Happy autumn Tuesday! 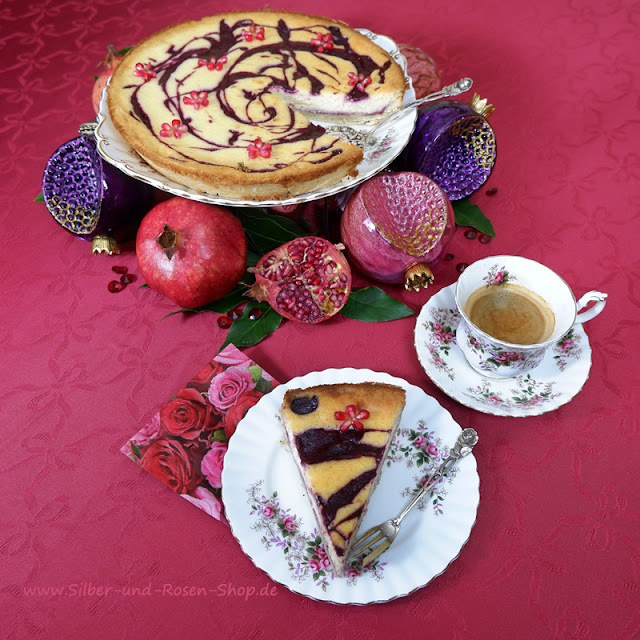 The plum cake looks delicious Johanna, and you are right about the best thing is having tea with friends. Even once a week! Your table is lovely for autumn. Happy First Day of Autumn! The tea time treats look like a perfect way to usher in the new season. What a huge grape leaves you show us here. 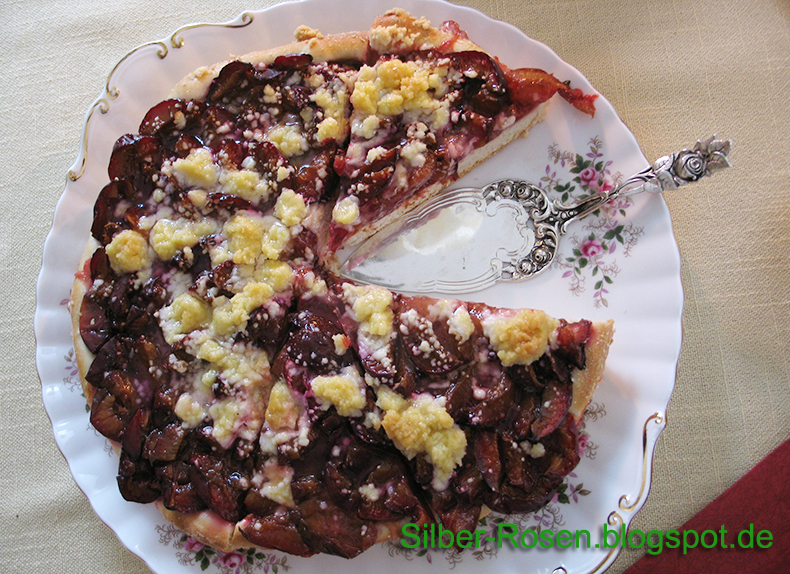 It looks so perfect for autumn and you of course serve the most delicious looking plum pie. What a presentation. Pflaumenkuchen ist eine feine Sache. I wish I could sit across from you and visit. Hi Johanna, autumn has arrived and your setting is beautiful. 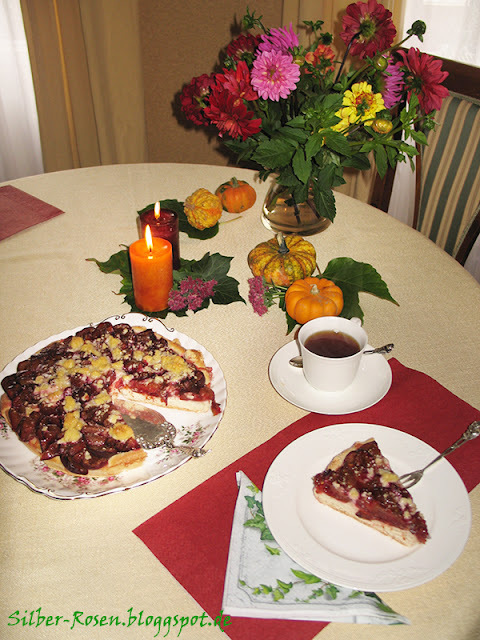 I love the dahlias and your pumpkins and the plum cake is so perfect for an afternoon tea. Yummy! Enjoy the colours of autumn dear friend. 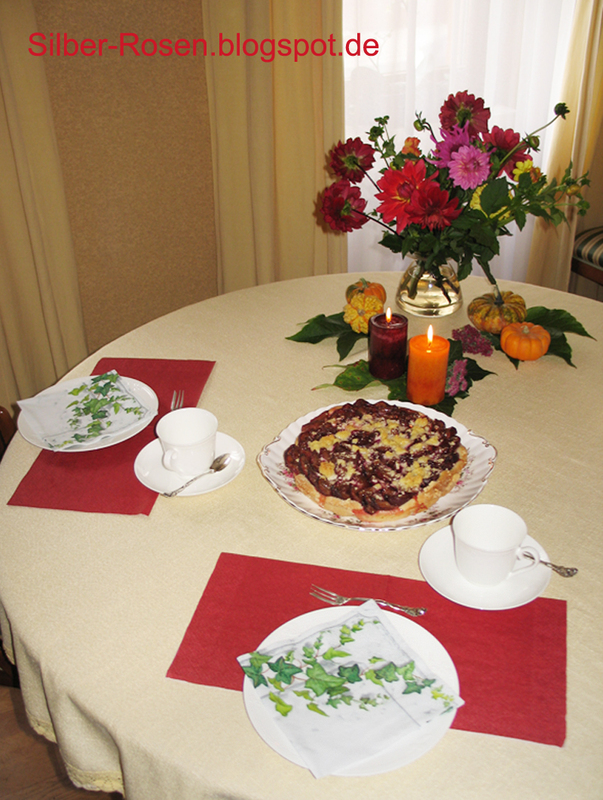 Oh my, what a lovely Fall setting with that yummy tart. I'd love the recipe if you can...wish I had a piece right now, so we can both finish it off! Thank you for your kind visit, dear Johanna. Yes, I usually cover the chicken pie with a solid piece of dough, only this time I made the pie for dinner and had just bought the 'little gadget' that cuts the lattice and wanted to try it, caz before I would do it by hand for say, Apple pie or other fruit ones. Enjoy Fall. Da würde ich gerne mal zum Kuchen vorbeikommen, das sieht sehr schön gedeckt und lecker aus.